Xtreme Gymnastics recognizes that your child’s desire to learn and grow lasts all year, even if school does not. That’s why we provide our School's Out Camp during academic breaks so that your child can keep moving and exploring. We provide fun, safe instruction for children between the ages of 5 and 13 so they can explore, engage and learn while they’re off from school. 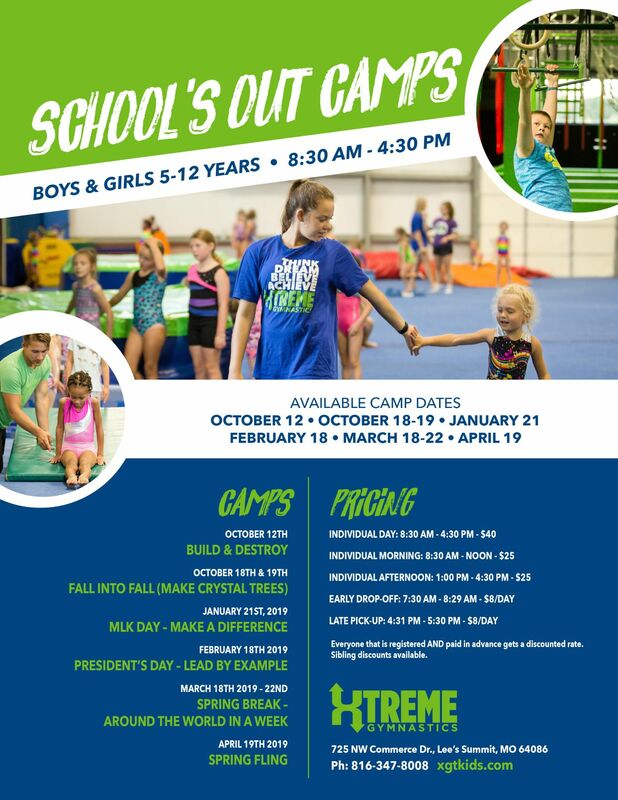 Our camps include: character development lessons, structed activies in one of our exceptional programs (gymnastics, trampoline, ninja warrior or dance), free play, reading and hands on STEM lessons. Call (816) 347-8008 today to learn more about our School's Out Camp dates. We provide schedule options to meet the needs of working families. Your child can either join us for a day, a few days, or an entire week! We have accommodations if your student needs morning, afternoon, or all-day instruction. A great attitude, the desire to learn and try something new! They will also need to bring running shoes, socks, shorts and t-shirt. Xtreme Gymnastics will provide two snacks per day for children, in addition, full-day campers are expected to bring their own lunch. Students with dietary restrictions should also bring their own snacks.